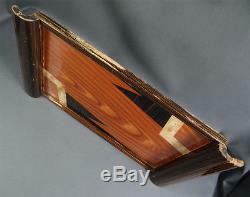 A charming and skillfully designed in around 1930`s Art Deco Wood & Glass Serving tray. Some minor traces of wear. Measures 18"x10" x 1.5tall. 45cm x 26cm x 3.5cm. 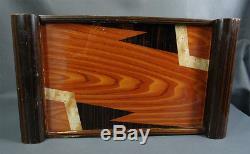 The item "Antique Serving Platter Tray Art Deco Bar Coffee Shop Wood&Glass GeometricRETRO" is in sale since Thursday, December 28, 2017. This item is in the category "Collectibles\Barware\Other Barware". 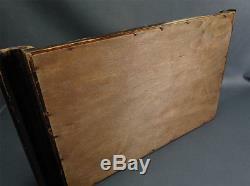 The seller is "rue-marches" and is located in EUROPEAN COMMONWEALTH.